Identical to the DTR2220ST however includes its? own built-in speaker. 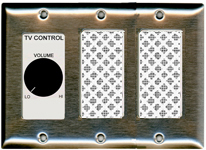 This eliminates the need for an external speaker and lowers the overall installed costs. 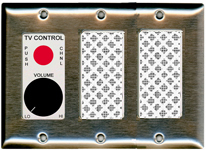 Packaged with a 2 gang stainless steel trim plate, screws, connectors, and features pre-stripped color-coded leads. Requires a standard 2 gang, 2? deep back-box. 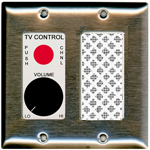 For those applications where the volume level is affixed at a specified level, yet visitors are permitted to change the channel. Comes complete with a 2 gang trim-plate, screws, connectors, and color-coded, pre-stripped 6" leads for fast & easy installation. Requires a standard 2 gang, 2" deep back-box. Features a headphone jack and a built-in speaker. 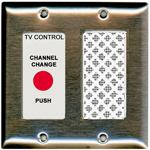 This model is ideal for dialysis and other locations where patients may wish to hear their TV privately where there is no need to change the channel, such as using a VCR or DVD player or even an infra-red remote control for channel selection. You can order the smaller 3.5mm (pod) jack(s) as desired. Comes complete with screws, connectors, and color-coded, pre-stripped 6" leads for easy installation. Requires a standard 3 gang, 2" deep back-box. For a four gang version, order model DTR2411ST. Same as the DTR2311ST above, however includes a remote button cord jack for patient use. Includes a built-in speaker, headphone jack, and volume control. You can order the smaller 3.5mm (pod) jack(s) as desired. Comes complete with a 3 gang trim-plate, connectors, screws, and color-coded, pre-stripped 6" leads for fast & easy installation. Requires a standard 3 gang, 2" deep back-box. For a four gang version, order model DTR2412ST. Same as the DTR2311ST above except no head-phone jack. Includes a built-in speaker and volume control. For a four gang version, order model DTR2413ST. 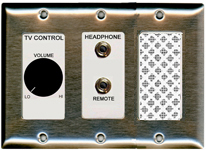 This model features the same control set as the standard DTR2220ST, yet includes a built-in speaker and a headphone jack for local/private listening use. You can order the smaller 3.5mm (pod) jack(s) as desired. 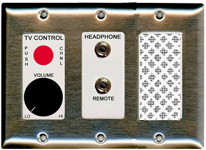 Packaged with a 3 gang stainless steel trim-plate, connectors, screws, and features pre-stripped color-coded leads. Requires a standard 3 gang, 2? deep back-box. For a four gang version, which includes an installed blank, order model DTR2421ST. Identical to the DTR2222ST except has a built-in speaker for local use. You can order the smaller 3.5mm (pod) jack(s) as desired. Comes complete with a 3 gang trim-plate, screws, connectors, and color-coded, pre-stripped 6" leads for fast & easy installation. Requires a standard 3 gang, 2" deep back-box. For a four gang version, order model DTR2422ST. Identical to the DTR2223ST except in a three gang four. For a four gang version, order model DTR2423ST. 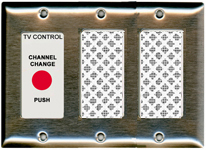 Like the DTR-2233ST above, this unit is for those applications where the volume level is affixed at a specified level, yet visitors are permitted to change the channel. 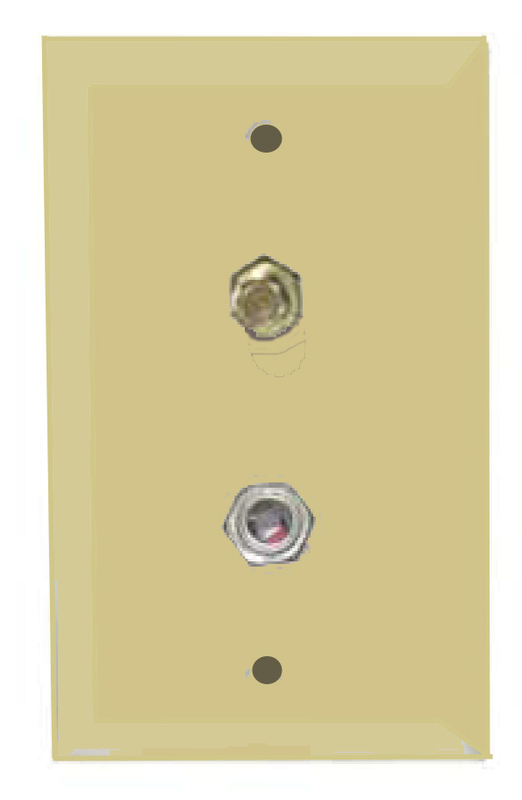 Identical to the DTR2322ST except is in a four (4) gang format. Comes complete with a 4 gang trim-plate, screws, connectors, and color-coded, pre-stripped 6" leads for fast & easy installation. Requires a standard 4 gang, 2" deep back-box. You can order the smaller 3.5mm (pod) jack(s) as desired. This model features the same control set as the standard DTR2220ST, yet includes a built-in speaker for local/private listening use. 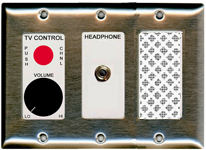 Packaged with a 4 gang stainless steel trim-plate, connectors, screws, and features pre-stripped color-coded leads. Requires a standard 4 gang, 2? deep back-box.